During the launch of the OPPO F11 series, OPPO PH did not reveal the price of the OPPO F11. They focused on the F11 Pro. They want to focus the spotlight on the P18,990 OPPO F11 Pro which is now available in stores. But on Friday, April 12, 2019, OPPO made a decision to release the pricing of the OPPO F11. Cheaper by P3,000, the OPPO F11 will arrive in stores on April 15, 2019, with a price tag of P15,990. This photo explains everything about these two. Both have VOOC flash charge 3.0, a relatively similar battery capacity, 48MP ultra night mode cameras, Color OS 6, almost the same screen real estate, but the Pro has a real full-screen experience because of the pop-up front camera. 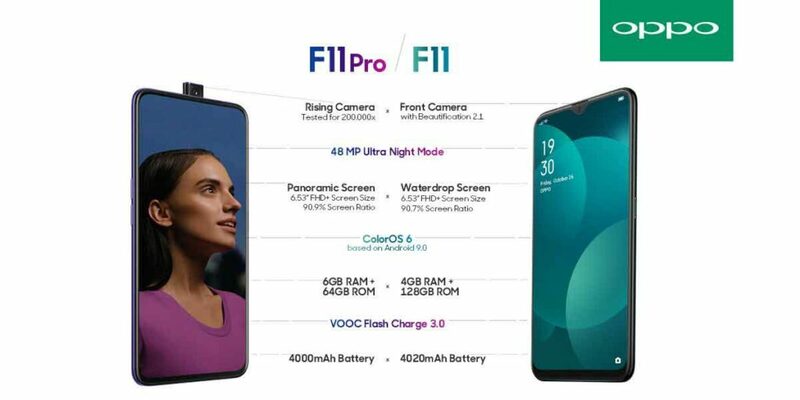 If you have the budget to spend, which one will you buy, the OPPO F11 Pro or the OPPO F11?